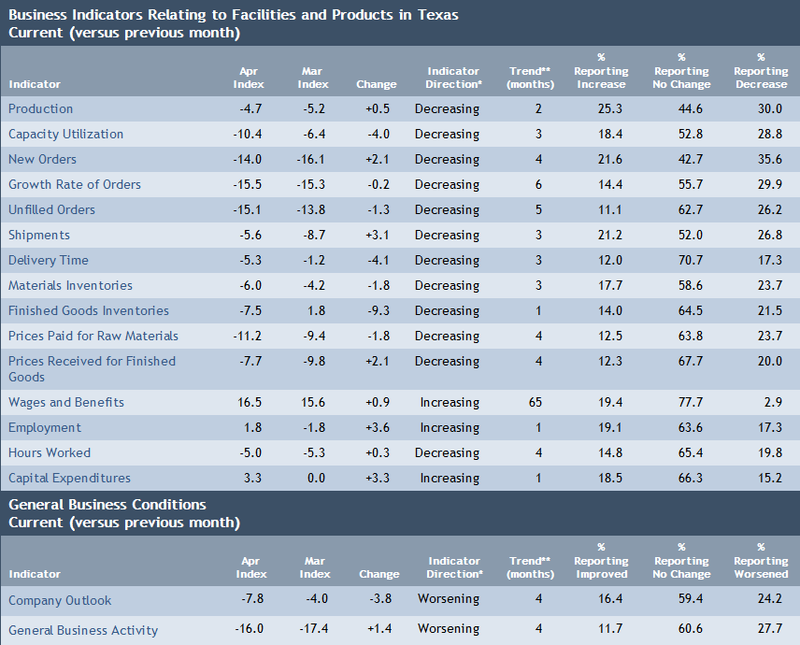 New orders in the Dallas Fed manufacturing survey came in negative for the sixth straight month today. Weakness was expected due to collapse in oil prices, but the business activity range number was lower than any Bloomberg Consensus estimate. Texas factory activity declined in April, according to business executives responding to the Texas Manufacturing Outlook Survey. The production index, a key measure of state manufacturing conditions, posted a second negative reading in a row, coming in at -4.7. Other measures of current manufacturing activity also reflected continued contraction in April. The new orders index edged up but remained negative at -14. The growth rate of orders index held steady at -15.5, posting its sixth consecutive negative reading. The capacity utilization index pushed further negative to -10.4, its lowest level since August 2009, and the shipments index edged up but stayed below zero at -5.6. Perceptions of broader business conditions remained quite pessimistic for a fourth month in a row. The general business activity index stayed negative but ticked up to -16 in April, while the company outlook index moved down to -7.8, reaching its lowest reading in nearly two and a half years. Weakness remains nearly everywhere one looks. The one bright spot had been the monthly jobs report, at least until last month. That "weather" report comes out Friday.